Incessant rains, especially in the past two days in the state, heavy landslide in between Nag mandir Mandi and Bomdila had made the road risky for life and property and unsafe for commuters. 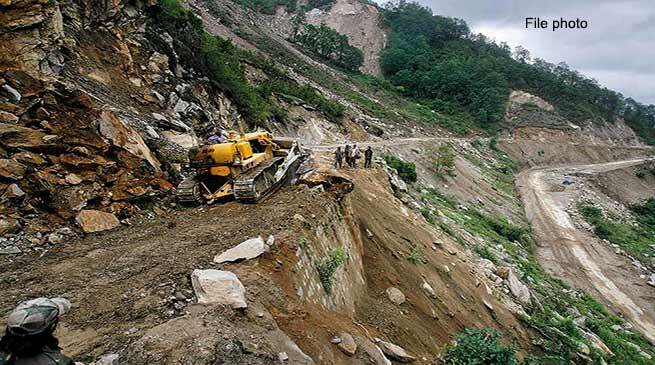 The District administration of West Kameng district has closed the road till Monday. West Kameng Deputy Commissioner Dr. Sonal Swroop informed that the due continues raining landslide was started from last three days at area, but on 14 June it was heavy especially in between Nagmandhir and Bomdila of west Kameng District, there is more than 20 place of the road had been blocked by heavy landslide. The district administration decided to close the road till Monday for the safety and security of the Commuters. She said that the restoration process of the BCT road is on priority during the said period and 14 BRTF is on job. The check post at Bhalukpong and at Nag Mandir have been directed to regulate the traffic accordingly and warned that any violation of the order shall be dealt as per law. Commuters can use the alternate road via Kalaktang to Bomdila and Tawang. She added.